What does it really mean to be an entrepreneur? The term has long been associated with individuals who venture out on their own, building businesses from scratch, going through cycles of success and failure, hope and despair. It’s never easy to start or run your own business, which is why there are certain characteristics that make them stand out – courage, resilience, creativity, ownership, risk-taking – just to name a few. However, there’s also no reason why the rest of us especially the ones working as employees in larger organisations – can’t adopt a similar mindset even if we are not running our own company. In the same way organisations are building the company, employees should be building themselves to adapt to change in a technologically-driven environment. ‘Occupreneur Coach’ Lindsey Broner argueed that everyone should, rather than could, start thinking like an entrepreneur if they wanted a more fulfilling life. “You always work for yourself and you are already your own boss even when you’re working in a large organisation,” she pointed out in her article Why You Don’t Have to Be an Owner to Be an Entrepreneur. 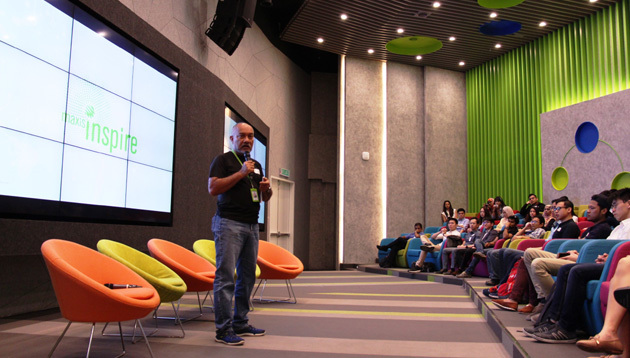 At a recent event hosted by Maxis as part of its Inspire Series, Adzhar Ibrahim, head of people and organisation at Maxis, spoke about what an entrepreneurial mindset meant to the organisation. Q There are probably more ways than one to define ‘Entrepreneurship’. What does it mean to Maxis? We can certainly draw inspiration from early entrepreneurs – those who take the risks in starting their own company. What gave them the push to venture out into seemingly unchartered waters? What kind of mindset did they need to help them succeed? There could be a variety of reasons. Silicon Valley’s success, for example, was driven by “an open-minded and diverse population that readily shares information, encourages experimentation, accepts failure and dispenses with formality and hierarchy”, according to tech entrepreneur VivekWadhawa. These characteristics, while more typically are associated with start-ups are no different from what we expect from our people at Maxis. We empower them to explore new ideas that will benefit not only the company, but their own personal development. Q What kinds of support does Maxis provide to ensure that employees inculcate this mindset? It’s never easy to instil an entrepreneurial mindset in a traditionally big company, especially when there are rigid guidelines or decision-making processes already in place. But the advantage of building such a mindset within large organisations is that you suddenly open up a new source of energy, passion and motivation. This is why Maxis provides the necessary tools such as Lynda (online video tutorials), SmartUp (peer-to-peer knowledge sharing platform), and support such as job rotation opportunities, scholarships and loans – to help create an environment where people feel empowered and unleashed from the usual corporate constraints. Additionally, we started the Maxis Inspire series for those who always wanted to shake things up at work, bring ideas to life, or create an impact on society. We wanted to create a platform that can offer firsthand insights from entrepreneurs and exposure to how an entrepreneurial mindset can impact one’s career, company or the community. Q The latest conference series was held in March this year – how did that pan out? The Maxis Inspire 2018, themed Making Entrepreneurship a Way of Life, was the second of our series in which we hosted a line-up of inspirational speakers from both established companies and start-ups who shared their entrepreneurial journeys, including the success (and challenges) they had achieved in their respective fields. We connected proactive, ambitious individuals with some of the best and brightest entrepreneurs in Malaysia. Successful individuals from the corporate and start-up worlds also shared their stories on how having a relentless entrepreneurial mindset made them champions in their fields, and how realising their ideas made an impact on their work and society. The one-day event drew 80 young participants comprising students, fresh graduates and working professionals who had the opportunity to discover what it took to achieve this mindset shift. They were also able to apply what they learnt at a workshop on problem solving and communicating solutions to relevant stakeholders. Image caption: Adzhar Ibrahim, Maxis’ head of people and organisation, speaks about how Maxis embraces the ‘entrepreneurial mindset’.